Join me on your journey to more freedom and ease! In my 20s, I developed tendonitis in my wrists and elbows, as well as neck and shoulder pain, from working on a computer. I had to take a leave of absence from work. Simple daily tasks like brushing my teeth or lifting a glass of water became painful challenges. I tried many ways to remedy my repetitive strain injury (RSI) but had very little improvement. I felt stressed and depressed. A friend suggested I try the Feldenkrais Method®. What a paradigm shift! My physical therapists had focused on icing, stretching and strengthening only the areas that hurt. In contrast, my Feldenkrais PractitionerCM looked at ALL of me—not only my whole body but also my activities, habits, thinking, emotional wellbeing, etc. My practitioner helped me understand how the way I sat, stood and moved created strain in my neck, shoulders and arms. I then learned new, more comfortable options. Feldenkrais® put me in the driver’s seat regarding my own recovery. Despite not all my symptoms being resolved, I felt calmer and more hopeful about my future. My relationship to my pain shifted from one of fear and resistance to one of compassion and acceptance. This allowed me to take better care of myself and to honor where my limits were each day. The changes I experienced went beyond my physical health. 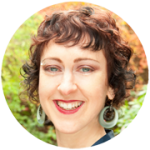 I took a huge career leap of faith from web designer to dance instructor despite less than 6 month’s dance experience when I started a dance teacher training program! After teaching dance for many years, I wanted new ways to help my students dance with more grace and to assist those with pain and limitations to be able to continue dancing. 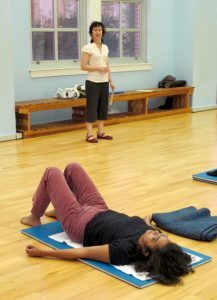 Knowing exactly where I could get those skills, I enrolled in a 4-year Professional Feldenkrais Training and became a Guild Certified Feldenkrais PractitionerCM. I know how chronic pain and physical limitations can squash hope. But the fact that you’re reading this means you haven’t given up. Both my personal experience and 8 years as a Feldenkrais Practitioner have shown me there is always hope and the potential for improvement. With kindness, patience and expertise, I’ll guide you in making the changes that reduce or eliminate your pain and tension. In addition to staying active, I’ll also support you in enjoying a better balance between being in your head and being in your body. Come start your journey to greater comfort and mobility! In addition to helping older adults relieve pain and move with greater ease, I also teach beginners and wedding couples how to dance. Find out more about learning to dance HERE.